Dlisted | Beards, Beads and Bolos: It’s The Country Music Awards Fashion Roundup! 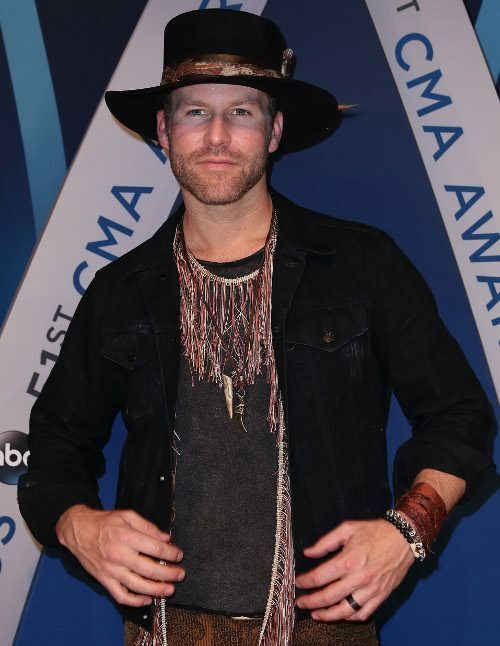 Beards, Beads and Bolos: It’s The Country Music Awards Fashion Roundup! The theme of last night’s 51st annual CMAs was Westwood Chic and the stars moseyed down the red carpet wearing their best robot brothel attire. As such, fringe, upholstery and feathers were the order of the day. That’s Drake up top there. No not that Drake, Drake White showing ’em how they ride in Nashville. For the most part, the ladies kept things more classically formal while the men ruled the night by showing off their creative country flair. Let’s saddle up and ride the range looking for lost doggies. Giddy up! Look yonder, huddled behind that there big ole cactus. It’s a trio of young bucks who’ve gone done raided the Sheplers over on highway 99. This group is called Midland. The middle one is committed to the rugged masculinity of a bygone era, the one on the right is committed to the high roller Las Vegas era of his grandpappy’s youth and the one on the left has a condition that makes him shrink very slowly. Midland is currently available for extra work and mustache rides. Now sitting in the jeep over there, looking out into the sunset and blowing smoke rings with their vape pens we have a couple of more modern cowpokes. No, that’s not Santino Rice on the right, that’s some other dude. This duo go by the name Locash even though I see no clear indication that they are indeed Straight Outta Locash. Though certainly a man (on the left) who has the brass balls to combine a soul patch, goatee, trucker hat and a scarf from Ross Dress For Less would have nothing to fear on the mean streets of that fictional berg. These two cattle bosses haven’t been on an actual horse in some time. They’ve been floating above Texas in their time machine since the mid 1970’s smoking cigars and waiting for the price of beef improve. They go by the name Brothers Osborne and they won the award last night for Tweeest Interpretation Of a Theme. Those were my favorite outfits of the night but there are plenty more oohs and aahs to be found in the gallery below. My pick for best dressed goes to Pink and her daughter who have been consistently killing it at awards shows with adorability. There are also a lot of fun “why is she/he there“s. And Leah Michele, whose invitation did you steal?